June 12, 2017 - Ralph and Wendy said goodbye to Chloe today. She had been having progressive problems with vomiting and was no longer interested in eating. My heart just breaks for them. She was the sweetest girl and should have had many more years with them. 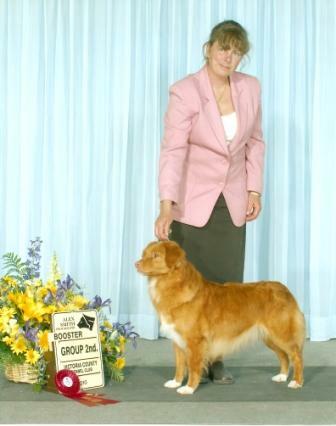 She accomplished many things in her 9-1/2 years - two show championships, obedience titles and the incredible Lifetime agility award. Wendy desperately wanted a WC on her so she would qualify for the Dobirstein award, but Chloe always had other plans with regards to retrieving tests. 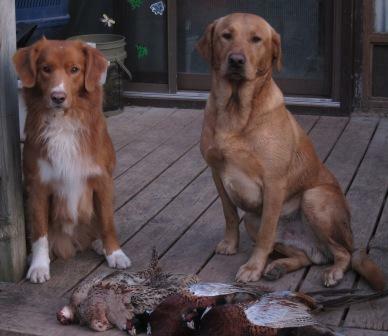 She did like to hunt with Ralph though and picked up ducks and pheasants. Maybe she just didn't like dead frozen birds.... I'm so glad that Chloe brought us all together as a family. I hope she is spending time with her sister Remi up there somewhere. May 23, 2017 - Nine weeks ago Chloe was diagnosed with aggressive stomach cancer. At that time she needed only 7 Qs to earn that impossible AAC Lifetime award. Unbelievably, she did it today! Sooo proud of Wendy and Chloe! 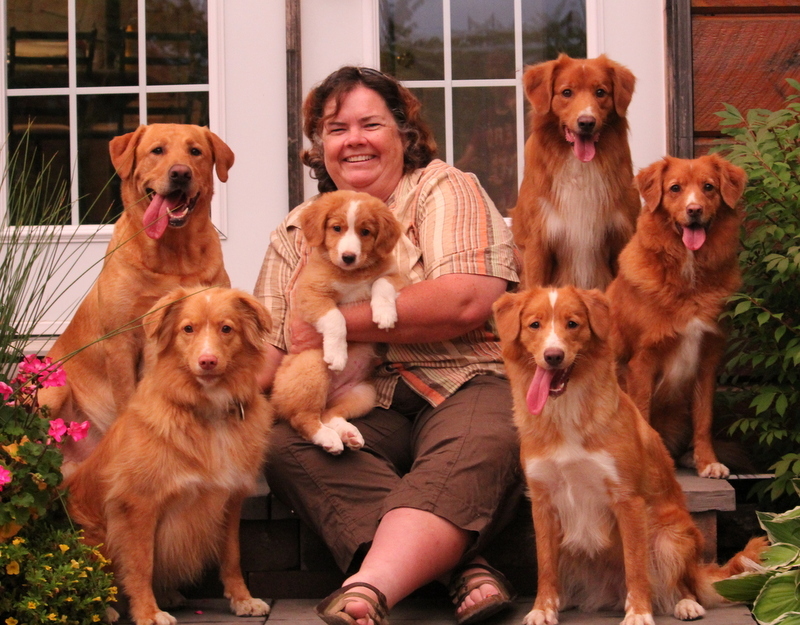 And so happy that fellow Toller person Billie MacLean was the judge to award that last Q! 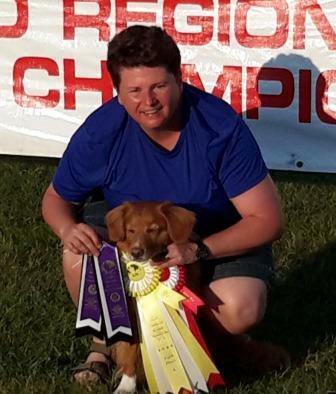 Aug 2016 - Khaleesi (Matty x Remi) earns her WC title! A lovely family photo! 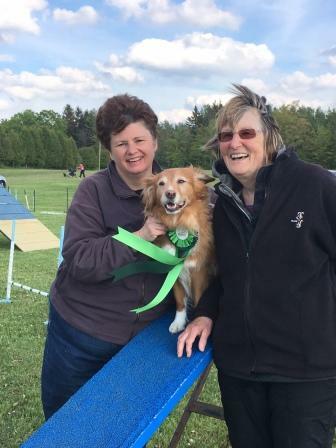 May 2016 - The Rowantide Girls have made a pact that when one gets a major agility title, the other two must also… At the Dog Agility Ontario trial on May 21, 2016, under judge Sharon Dunsmore, Bounty, Chloe and Addie all brought home gold and silver. Bounty got her Gold Award of Merit (50 master standard Qs, 100 master games Qs), Chloe got her Expert Gambler Gold title (50 master gambler Qs) and Addie got her Expert Standard Silver title (25 master standard Qs). Rowantide girls rock!!! 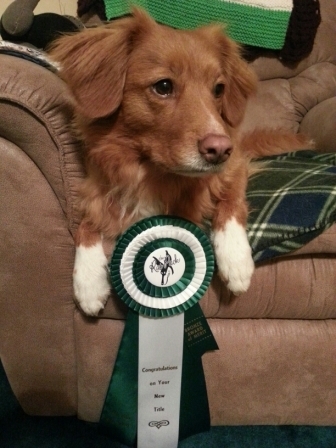 May 2015 - Chloe and her Masters Steeplechase ribbon! 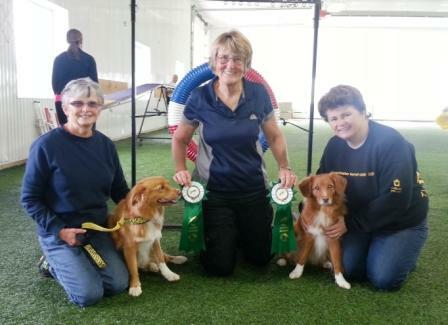 April 2015 - Rowantide girls had a fantastic agility day yesterday with Dale and Wendy! Chloe qualified in 5 out of 5 runs, Bounty 4 out of 4, and Addie 3 out of 3!!! All 3 girls managed a very difficult gamble run that tripped up most of the other competitors. 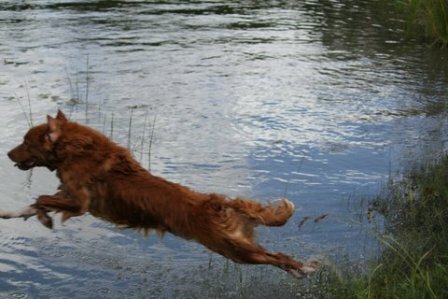 This was Addie's first time running after several months off for an injury. This finished Chloe's AAC Gold Award of Merit (50 Master Standard qualifying scores and 100 Master Games qualifying scores)!!! She just turned 7 last November and Bounty just turned 9. Dale and Addie have only been partners for 2 years. So proud of all of them! 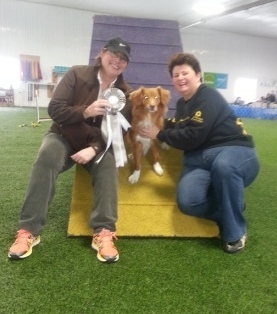 Feb 14, 2015 - Tipsy goes WB and BOW for 2 points to finish her Canadian CH! She goes BOB the next day for a nice win. 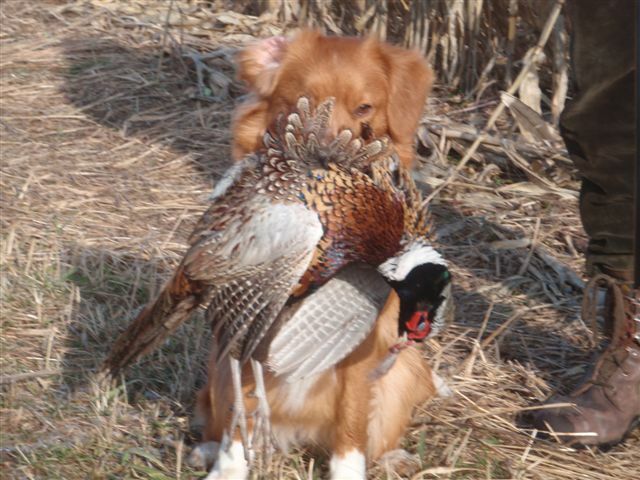 Sept 2014 - Chloe has had some trouble with "formal" field tests, but proved she could do it when it counts - hunting with Ralph!!! Our total was 425 points and she placed 5th in the 10" double drop veteran class, which qualified her for the Nationals!!!!!!!!! So, not only did we come home with our qualifier ribbon but also lovely yellow 5th place ribbon. I am thrilled to bits. 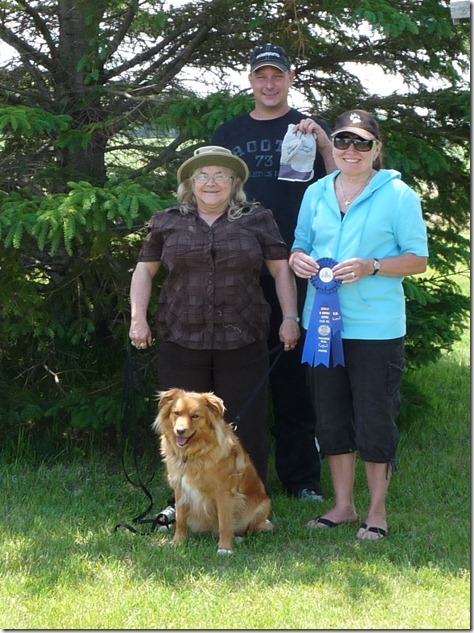 June 15, 2014 - A great weekend at the Ontario County Kennel Club show in Orono! Tam continues to surprise me! 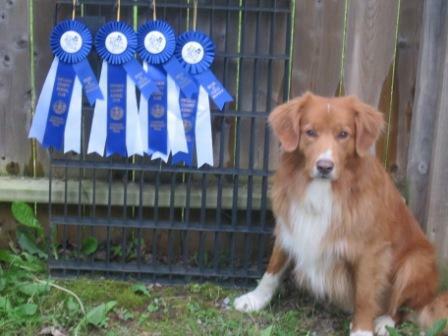 With very little "formal" obedience training, he managed to qualify in 4 Novice obedience trials this weekend with high in class ribbons for all 4, with very consistent scores ranging from 185-190. This title now qualifies Tam for the Dobirstein award! 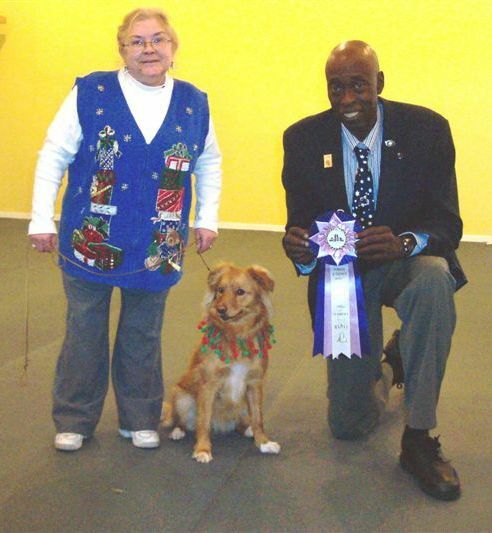 June 14, 2014 - News from Dale that Addie got her Master Agility Dog title today! This team has come so far in such a short time! Addie and Bounty both qualified in all 3 events that they were entered in today. 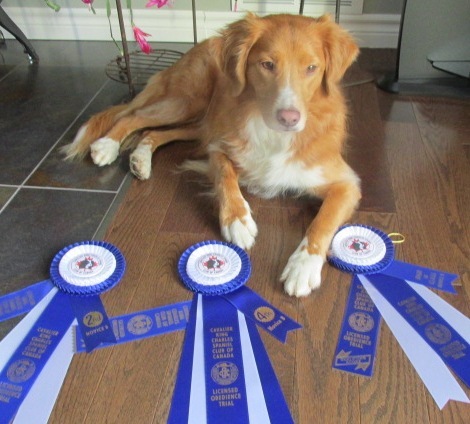 May 4, 2014 - From Wendy - Chloe came through in the rain at the RU Ready agility trial yesterday and got her 25th master gamble Q for her Expert Gamble Silver title! 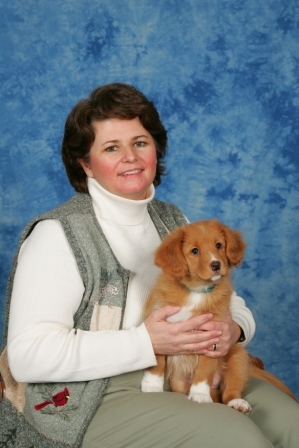 April 2014 - I had to say goodbye to Taylor last Tuesday, just one month shy of her 12th birthday. She had developed a nagging cough a little over a month ago and chest x-rays confirmed cancer. She did well with good appetite, still going on our daily walks and even chasing a squirrel, but inevitably lost the fight. She was my constant companion and I have been constantly stumbling into the big hole that is left at my feet. She was my once-in-a-lifetime girl. 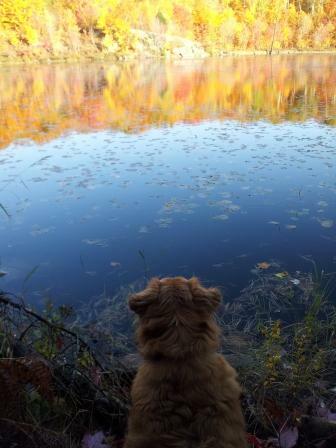 I hope she is somewhere chasing birds, swimming, and eating Timbits. RIP my best girl. 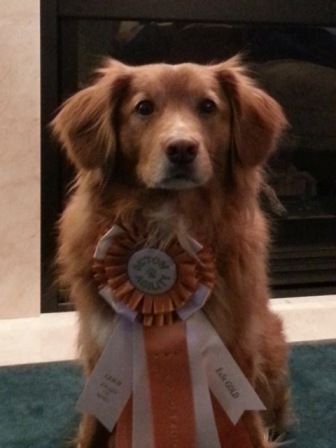 Chloe earns her Agility Association of Canada Silver Award of Merit on Dec 29/2013!!!! 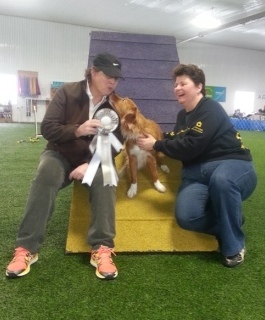 And to show her appreciation, she gives the judge (and Toller breeder) Sue Miller a kiss! The Silver Award requires 25 Master Standard and 50 Master Games qualifying scores - mind boggling! 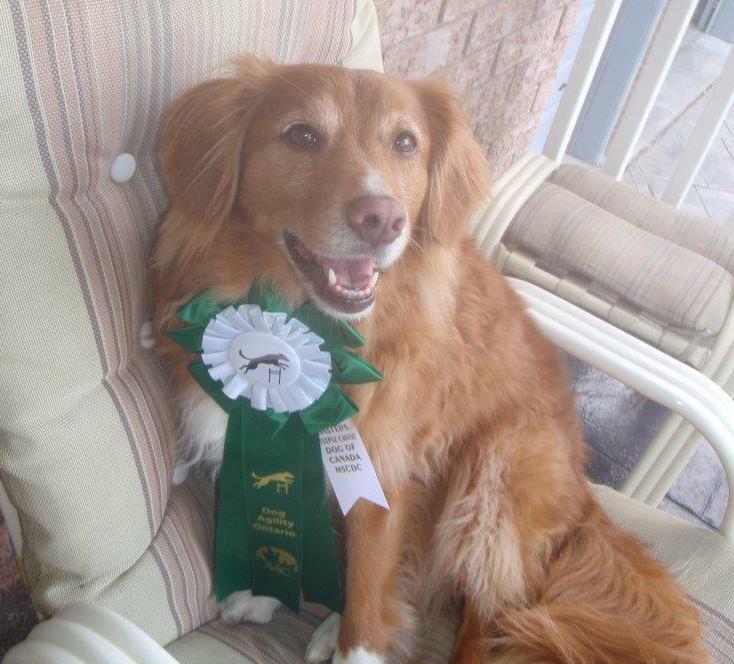 Chloe is the top agility Toller in Ontario for 2013 and 6th Toller overall in Canada! A great dog and a great owner = a great team! I couldn't be prouder. 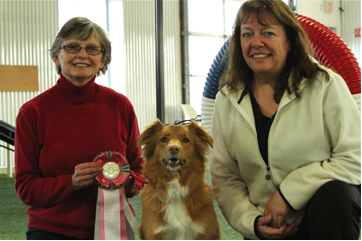 Nov 2013 - Bounty has her AAC Bronze Award of Merit and Addie gets her first agility title - ADC (Agility Dog of Canada). Go Dale and the girls! 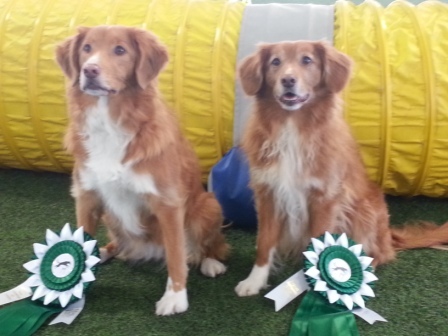 Sept 22, 2013 - Bounty and Chloe both earn their AAC Expert Standard Silver titles! That means 25 Master Standard qualifying scores! Here's a photo of 2 happy ladies and their happy dogs! Very proud of all of them! 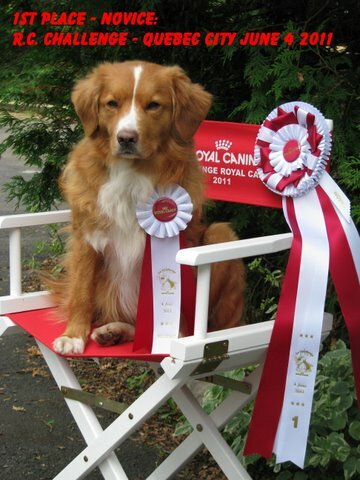 August 30, 2013 - Wildchild Tam earns his 4th Finished pass for the HRCH title! And an extra one the next day for the cherry on top! 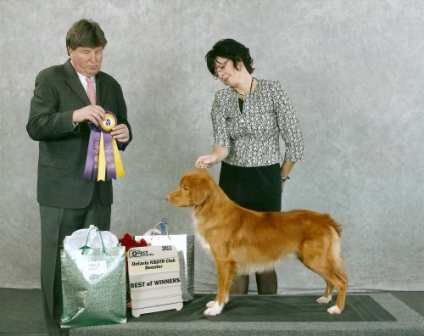 He just loves this game so much and he has trouble containing his enthusiasm at tests :o)) He is now the 3rd Toller to have both the UH and HRCH titles, with his aunt Taylor being the 2nd and a talented girl named Port in the States being the first. Now, to finish up the CKC MH title (he needs 3 more passes)! 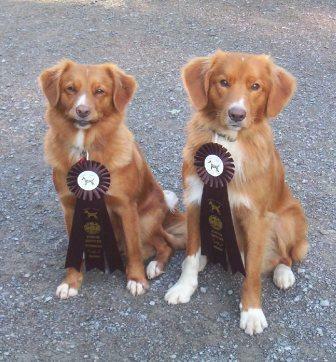 July 2013 - a nice photo of Bounty and Chloe with their ATChC ribbons! June 15, 2013 - Bounty earned that last elusive point for her ATCH! Dale and Bounty have become such a great team. Proud of the "Yahoo Girl"!! 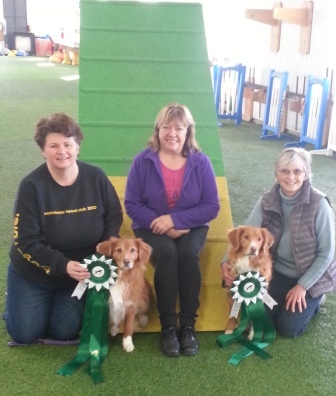 April 29, 2013 - another great day for Wendy and Chloe, earning her Bronze Award of Merit - 10 master standard Qs and 25 master games Qs!!!! WooHoo!!! 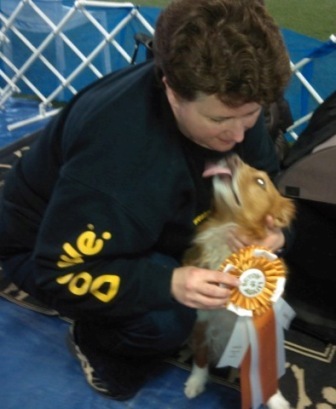 April 6, 2013 - Chloe earns her ATChC today!!! Huge congratulations to Wendy for sticking with this little girl and never giving up on her! We are so proud of the two of them! 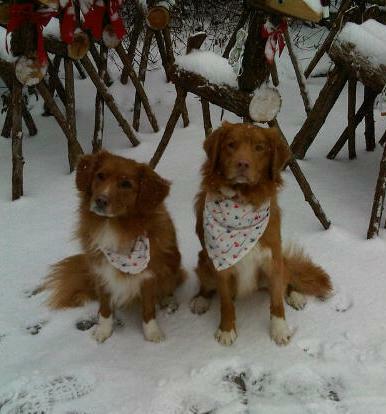 Had to share this picture of Mack (Mattie x Remi) and his friend Brody after our walk in the woods on Saturday. Although you can't see the rest of Brody's face, you can sure tell that he is wearing a huge smile! Thanks to Sandi Prentice for this shot. 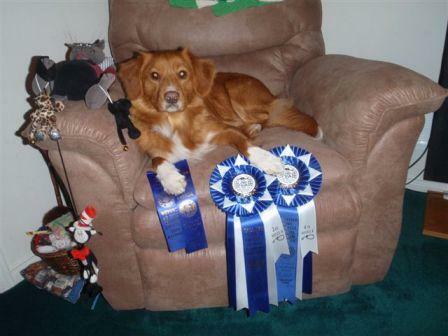 Dec 2, 2012 - Chloe decides to show the world what she can do and finishes her Master Agility Dog of Canada title!! It has been a frustrating year for Chloe and Wendy, as they worked through some health issues, but she is back in the game!! We had a great time doing some Upland training today in Roseneath, on an unseasonably beautiful November day. Tam has always loved playing with pheasants and Justin found his new passion today as well! 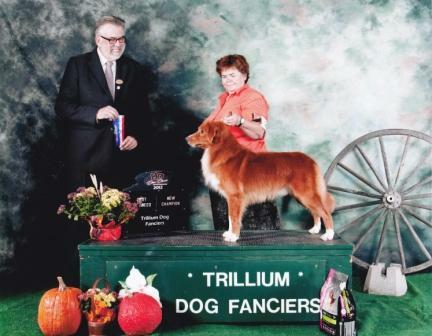 October 26, 2012 - Tam finished his Canadian show Championship today! Now we just need a CD to qualify him for a Dobirstein award. We will get working on that after the upcoming pheasant games! 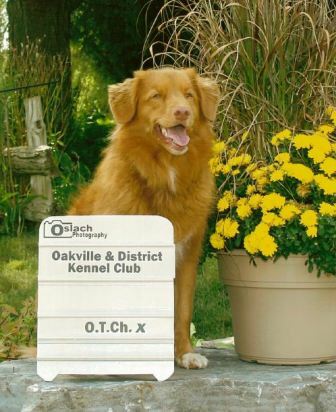 Sept 30, 2012 - Tam passed his third CKC MH test in a row today! It was a very tricky test and he did a great job! 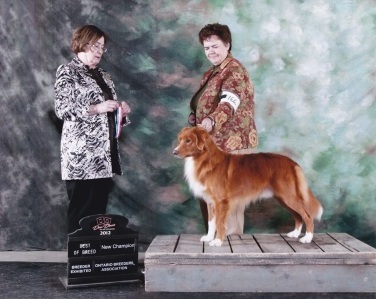 He is now halfway to his HRC Finished title and halfway to his CKC MH title. 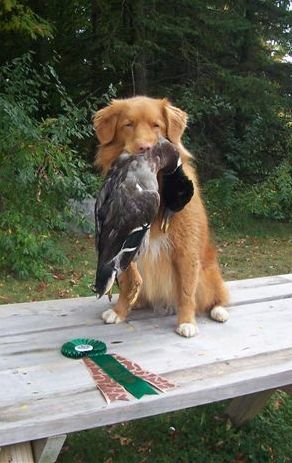 Good dog Tam! The day before, Tam's half-brother Jiggs earned his last Senior Hunter pass for the title at the same test! He has had a great year too! 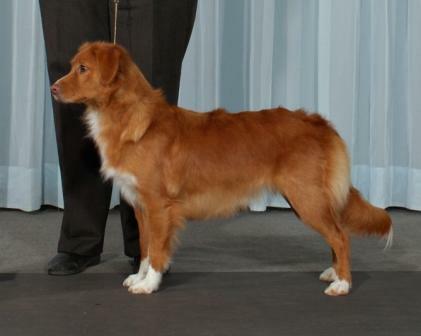 September 2012 - I am still in shock, but Tam passed his first two attempts at CKC Master Hunter this weekend!!! He did a very clean job all weekend except for a little excitement at the double blind on Sunday afternoon. He was as high as a kite by then and really thought it was ridiculous that we were right beside the water (which he LOVES), but I was telling him to run a blind out into the field :o)) In the past, I found Master to be very intimidating, and I was nervous this weekend, but really felt like we deserved to be there, and I am feeling so confident about Tam's work in the past few months. Very very proud of my wild child! He will need 4 more passes for this title, since he never ran Junior or Senior, so not sure when we will find the time or the money to chase them, but we will! Sept 2012 - Tam has a great weekend at Georgian Bay HRC!! 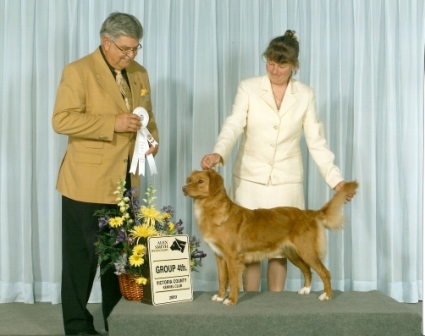 He earned his second Finished pass under the same judge as the first one, passing a very tough test in which only 12 of 25 dogs passed. He nearly passed the second day, getting all the way to the final bird on the water. Another tough test in very challenging water conditions. It was a very courageous effort. Will have to wait until next spring to get the last 2 passes to title. 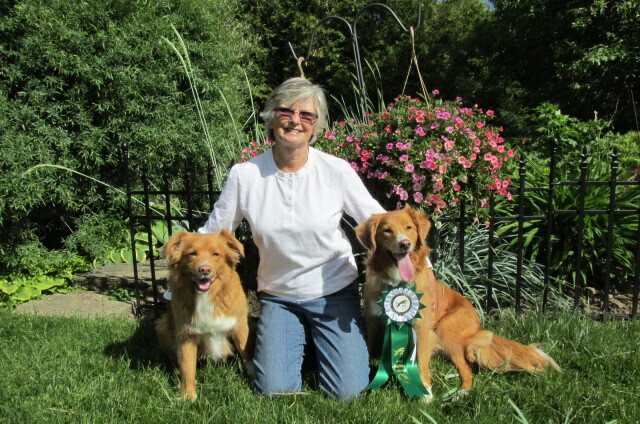 July 2012 - Remi and I entered our first agility trials at the Toller Regional Specialty in Barrie. 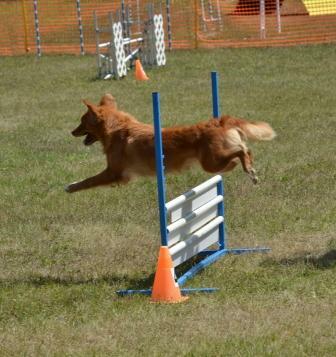 We started training for agility last winter, so Remi could have some fun after retiring from field. We had a great time in Barrie and passed 3 of her 6 attempts - she failed a couple and I failed one :o)) She is very very fast and I just can't keep up to her! 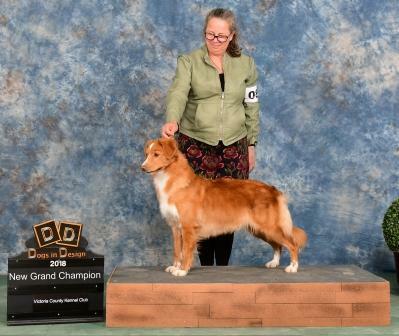 So, she has 1 CKC Started pass and 2 CKC Jumpers with Weaves passes - we'll have to try to at least finish up those 2 titles sometime. 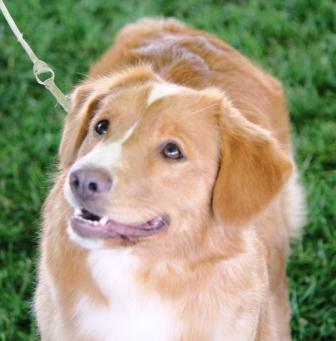 June 15, 2012 - Ember earns Rowantide's first tracking title! May 2012 - Jiggs earns his OTCH title in 3 straight passes!!! Just awesome! Just wanted to share this great picture of Chloe flying over a jump last weekend at the Ontario Regionals. 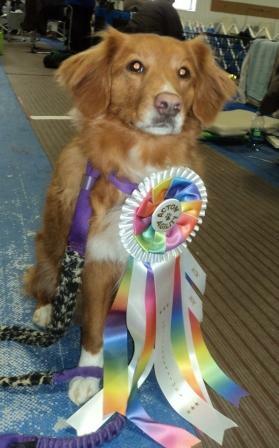 Apr 2012 - Addie finishes her CH today at the VCKC show in Lindsay. We are both happy that is over and done, so we can move on to more fun stuff! 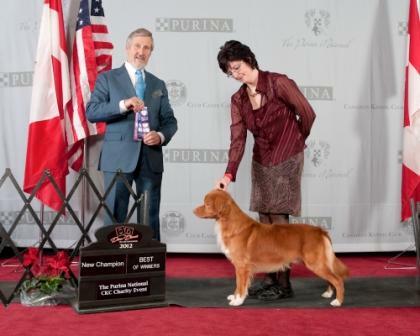 Mar 2012 - Dasher finishes his CH in fine style at the Purina National, ably handled by Lola Nichols. Now, on to some working titles! 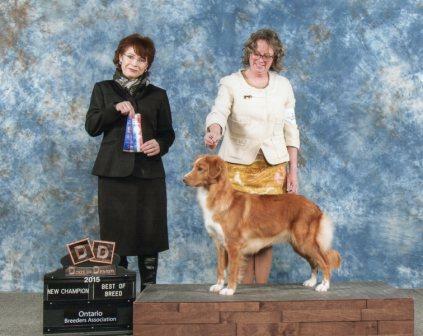 Feb 2012 - Tam surprises me yet again, by taking his first Best of Breed in the conformation ring at the Ontario Breeder's Show - a small win really, for only 2 points, but a big milestone for me, since it is the first Best of Breed on any of my dogs with ME on the end of the leash probably in about 8 years! Yeah!!! I can show my own dogs!!! And, as a special bonus today, I got to watch Bounty, Jordi, and Chloe run agility!! Feb 2012 - Bounty is amazing!! 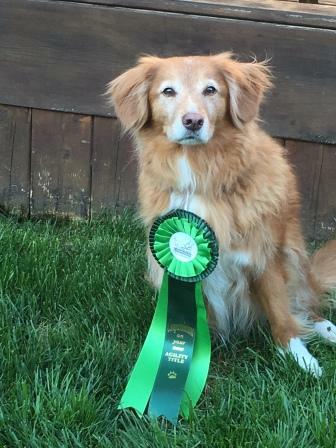 After running her first agility trial just over a year ago, she earned her MADC title this past weekend! What a girl! And what a great trainer she has!! 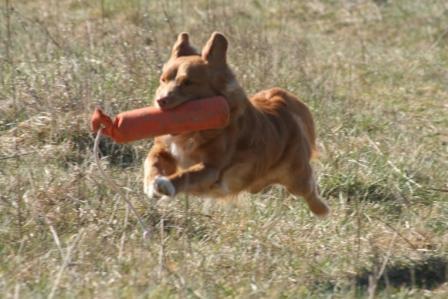 Nov 19/11 - Tam does a very nice job, passing 2 Upland tests to finish his Upland Hunter title! 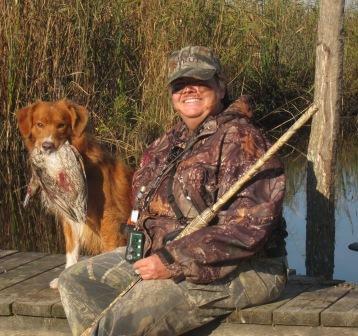 Oct 11 - Tam and I were invited to go duck hunting with a friend from our local hunt test training group. 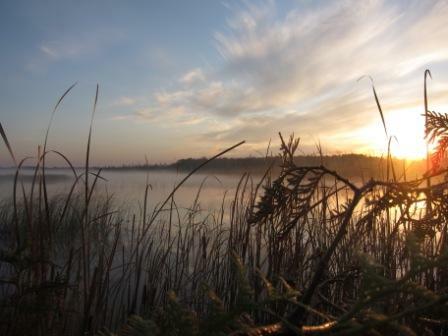 The weather was perfect for a boat ride and hanging out in a duck blind for a few hours, but not so perfect for duck hunting! We didn't even get a glimpse of any ducks on the Friday night, and were just about to pack up and head home Saturday morning when one lone duck showed up. Nick shot it and Tam got to retrieve his first "real" duck - one that hadn't come out of the freezer at least, LOL. 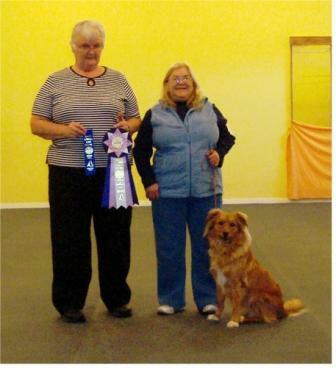 Oct 22/11 - and just like that, Bounty becomes an Advanced Agility Dog of Canada (AADC)! August 2011 - Tam holds it together for 2 WCX tests in one day and passes both - picking up 8 marks, 4 blinds, and doing 2 double walkups with an honour - his little brain was pretty tired by the end of the day. Proud of my wild child! Not to be outdone, Addie does an awesome job on her first official field test and earns her WC. Land and water marks all were in very high cover. 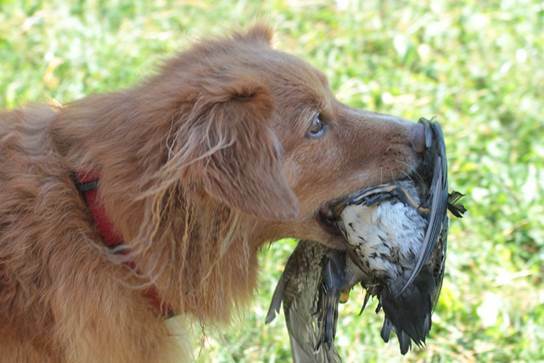 She had a big hunt for one land bird, but persevered and found the bird. Good girl! 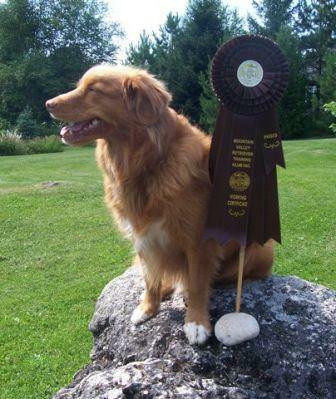 August 2011 - Remi passes her 3rd Seasoned test at the Ottawa Valley HRC test, earning her HR title. She was the only dog that did the marks in the correct order! 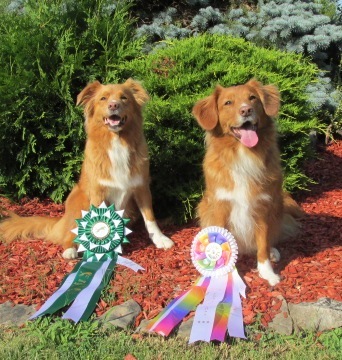 June 2011 - Jiggs & Gary were invited to the Royal Canin Challenge in Quebec City. 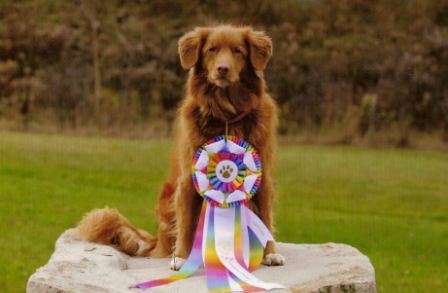 It's only for dogs who achieved 1st place in 2010. 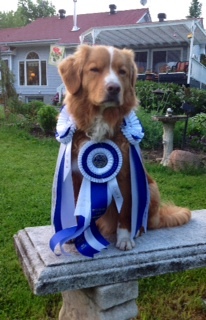 Jiggs came in 1st place among the 6 Novice dogs entered and 3rd overall! WooHoo!!! What a nice working litter this turned out to be! June 2011 - Remi goes 3 for 3 to earn her CD, finishing up with a nice score of 193-1/2. 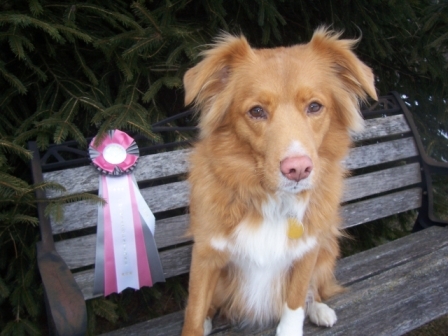 This qualifies her for the Dobirstein award from the Canadian National Toller Club. May 2011 - Wildman Tam keeps it together and does a nice job earning his HRC Seasoned title at my home club's test, earning a 4th pass for "insurance" on the second day. On to Finished!! 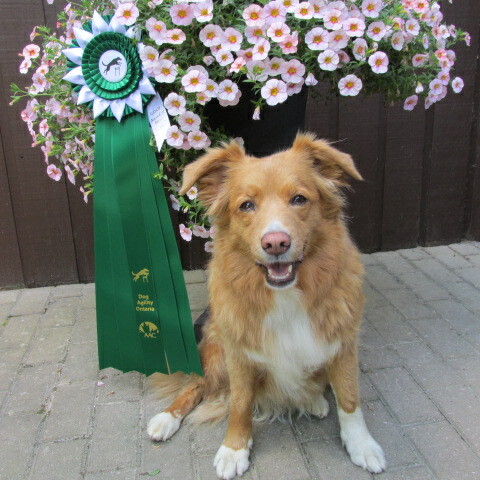 May 2011 - Jordi is ranked #2 agility dog (all-breed) in Canada for 2010!!!! WOW!!! 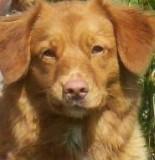 Watch for her write-up in the Dogs in Canada magazine coming soon. 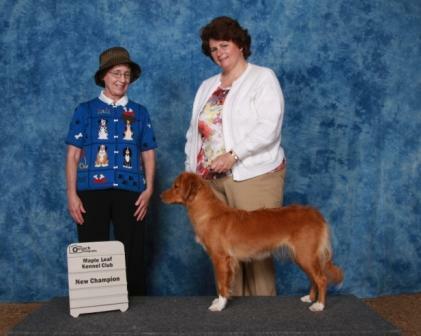 We attended the Purina International show March 11 & 12, 2011. Taylor finished her All-Breed show career very nicely with two BOS wins - the second one at the booster with a very nice entry. She will be spayed next week, so will only be making an occasional appearance in the show ring, at a Specialty in the Veterans' class. Hard to believe she is almost 9 years old! Tam surprised me by taking WD on Sat for 2 more points, so he now has 4 points towards his Canadian Championship. 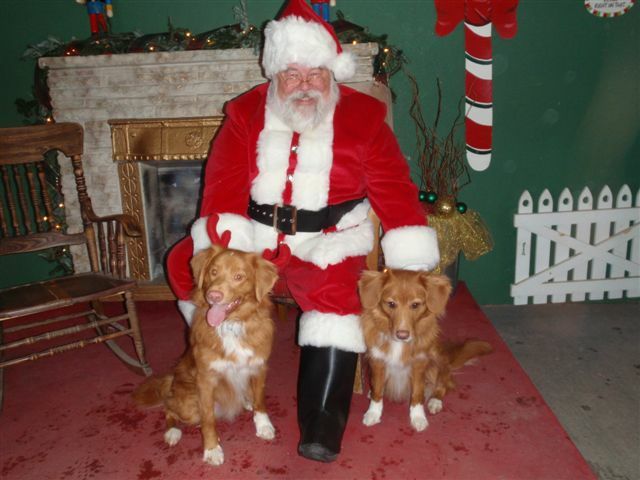 Addie enjoyed spending time socializing with the crowds at the Toller booth, and her 2 brothers Bugsy and Dasher. Ruby has found a new home! 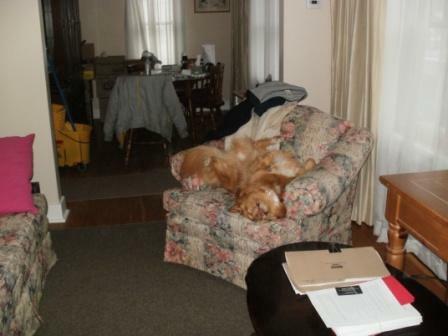 She is now living with Randy in Niagara, and I think she has settled in nicely! Well, Bounty is having a lot of fun in her new home with Dale and David Dee. 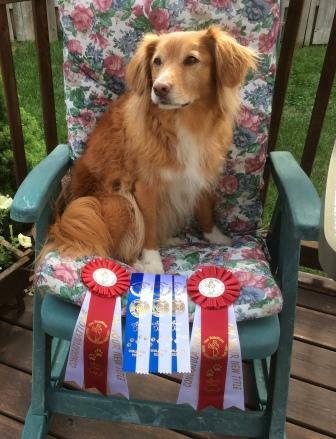 Dale informed me when she agreed to take her, that she would just be a pet....... She entered her first agility trial this weekend and came home with 2 qualifying ribbons! This, despite not having been trained on most of the equipment yet! She also has a new BFF, Roy, who apparently has never paid attention to the other dogs, but adores Bounty. After a long hard road, Jordi finished her MOTCH title on Dec 4/10!!! 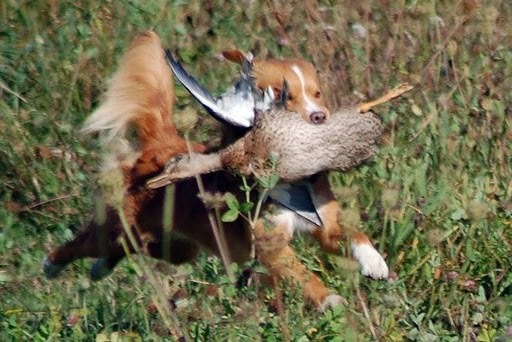 It will probably be the only MOTCH ever on a Rowantide Toller, I can't imagine ever working that hard at obedience - LOL. Jordi is now retired from the obedience ring. It will be interesting to see what she and Dale get up to next! Mom Taylor, and I are so proud! Taylor is very proud of her kids! Chloe is cleaning up in the agility ring! 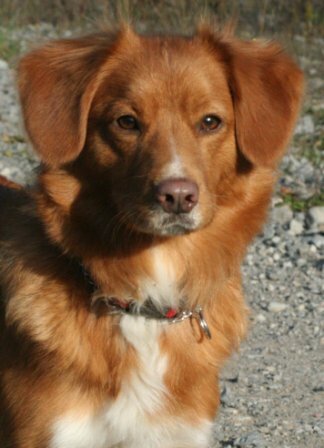 She has just upgraded her SGDC to AGDC (Advanced Games Dog of Canada). 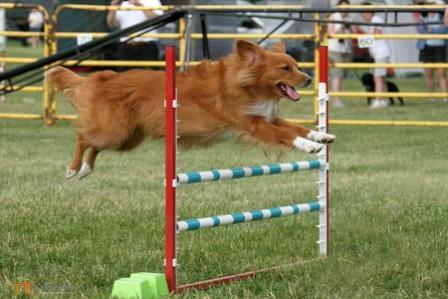 That's 8 agility titles in the last 11 months! On November 7th, Ember finished her Rally Excellent title! Wow again! On 10/02/2010, Jiggs passed the WCX! Gary has done a great job with him! On 09/26/2010, Jordi earned her Junior Hunter!!!! Passing 3 out of the 4 tests she was entered in. I can't thank Dale enough for all she has done with this awesome girl! 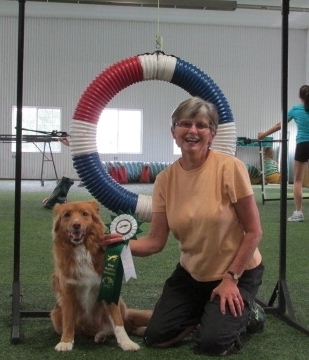 On 09/11/10, Chloe again upgraded her agility titles by finishing her AAC Advanced Standard agility title. She is smokin'!! 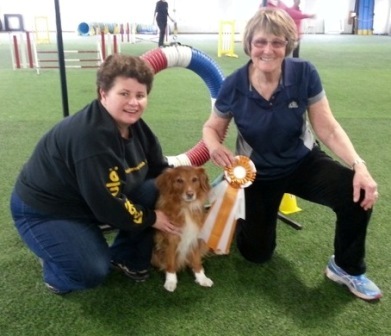 Rowantide had a great weekend at the Regional Specialty in Long Sault! Chloe upgraded her AgNJ to an AgIJ, then made the cut for BOB in the showring later that day! At the field test the next day, Tam did a great job and passed his WCI, and Remi (4 weeks pregnant) passed her WCX. 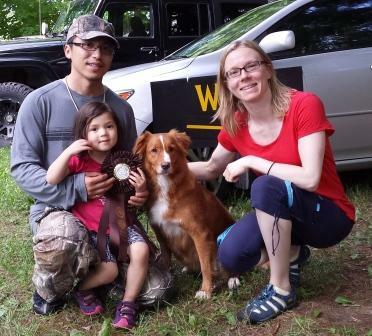 On June 27th, we earned 2 new titles at the first Muskoka KC WC test. Tam enthusiastically passed the WC (even without cheating on the water marks!) and Remi did a much better than expected job on the WCI for a ribbon. This is Tam's first title, so he's pretty proud. On May 29/30, Tam passes his first two HRC Started tests. These are the first 2 ribbons for this very enthusiastic boy, with more to come, I'm sure! 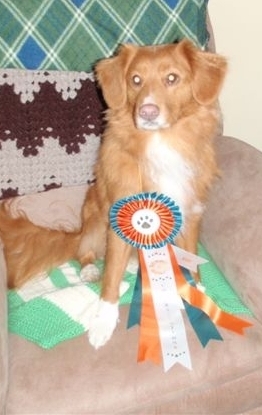 On May 1, 2010, Taylor wins the Toller booster at VCKC (entry of 17) and goes on to a Group 2nd!! This was a very exciting win! Thanks as always to handler Deanna Ross. 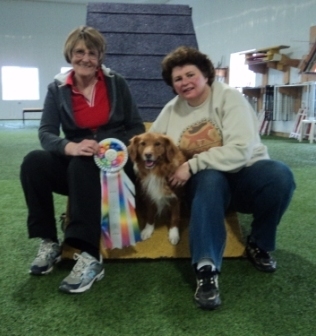 On May 1, 2010 Chloe finishes her CKC Agility Novice Standard title! This girl is on fire! On April 18, 2010, Reese finishes her CD! Reese is from the Skippy/Tidy litter. 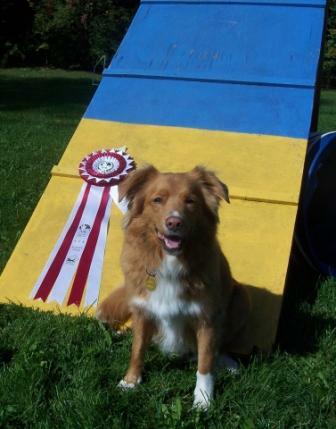 On Feb 5,2010, Chloe gets her first agility title - ADC (Agility Dog of Canada)! 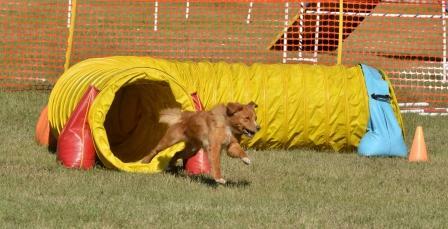 Then on March 21st, she gets her next agility title - SGDC (Starter Games Dog of Canada)! On Dec 19, 2009, Chloe's sister, Ember, finishes her CD! Way to go Bernice and Ember! On Dec 12, 2009, Chloe finishes her CD, in 3 straight trials! With pretty nice scores too - 191, 193, 195. I am so proud of this team! 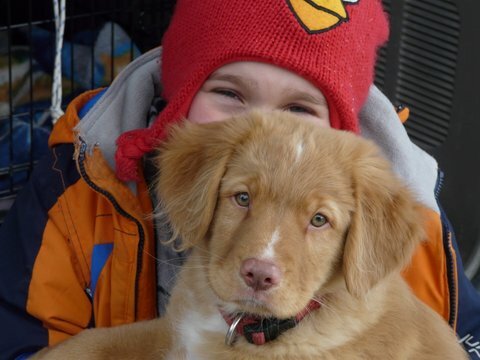 Dec 5, 2009, Chloe goes Upland Hunting with Ralph for the first time. She does an awesome job! 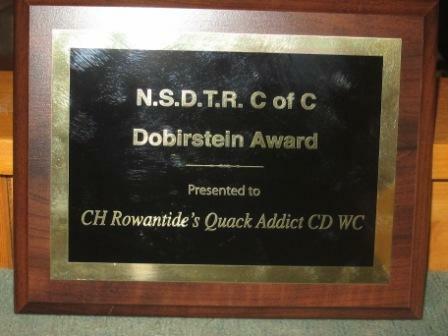 October 31, 2009 was a great day for Rowantide! 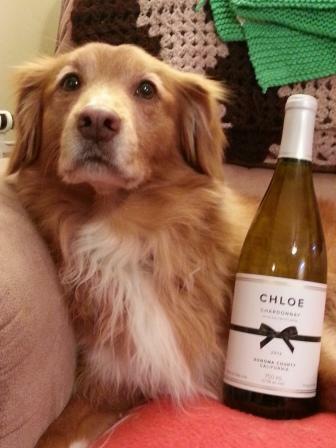 First, Chloe finishes her CKC CH! It's been a hard road, but I knew they could do it! On Sept 26, 2009, Jiggs earns his WCI and comes within a whisker of his WCX! Huge accomplishments for this young boy! He also passed 3 JH tests this summer to earn that title. in an entry of 130! & Rowantide's Jiggs is for Reel WC. 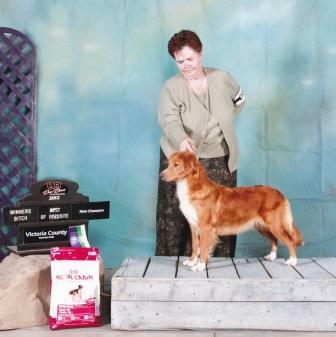 Rowantide has an awesome weekend at the VCKC show in April 2009. Remi takes WB, BOW, BOB over Specials and a Group 4th!!! This finishes Remi's Canadian Championship with a 5-point major. She is now officially CH Rowantide's Remember Me.